China’s largest ride-hailing company is facing challenges from Meituan-Dianping and AutoNavi. It’s no secret that Chinese ride-hailing companies, such as Didi Chuxing, are operating on massive losses. But how much? The question, for the first time, got answered in a confidential document obtained by a Chinese local media, All Weather TMT. According to the document, Didi Chuxing incurred a loss of US$ 300 – 400 million in the year of 2017 against a GMV (gross merchandise volume) of between $ 25 – 27 billion, which upped 70% from a year earlier. CHENG Wei, Didi Chuxing founder and CEO told media in November 2016 that at that time Didi has surpassed Uber in GMV and tripled that of Uber rides. Didi handles 7.4 billion rides for 450 million customers last year. The Beijing-based ride-hailing monopoly also expects to make a small profit in 2018. Ride-hailing is a highly subsidized industry. Didi Chuxing won a dominant place in China after acquiring Uber China operations in 2016, concluding a costly war. Since then, Didi Chuxing stopped subsidizing drivers and passengers on a large scale and started collecting over 20% from each fare. Those all helped the cash-burner narrow down its losses. If everything keeps going down the same track, Didi is very likely to stop bleeding money and to turn a profit this year. However, two less-than-expected competitors intruded into the market recently, and dealt a blow to Didi’s hope of profit making. Meituan launches in Shanghai. Image credit to Meituan-Dianping. 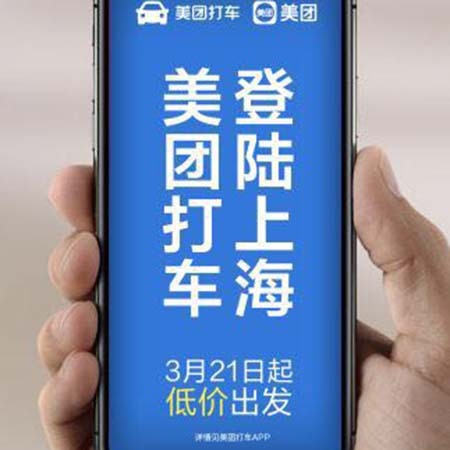 Meituan-Dianping, Tencent-backed O2O e-commerce platform, has kicked off its ride-hailing service in Nanjing and Shanghai, claiming to have snapped up one-third of the market share in the two cities. Challenge not only comes from Meituan-Dianping. Alibaba’s mapping unit AutoNavi has also launched a carpooling service, starting from two Chinese cities with a plan for a national launch. Didi has yet to make its responses to the aggressive attacks. But with the new disrupter in the space, Didi Chuxing has to defend its territory, probably through offering more subsidies to both drivers and passengers, which eventually would weigh down Didi’s profit-seeking plan in 2018.